Because each tour is completely customized, we can only provide a guide to prices. Tours may cost more or less depending on the accommodation chosen by you, the number of people in your group and the time of year. 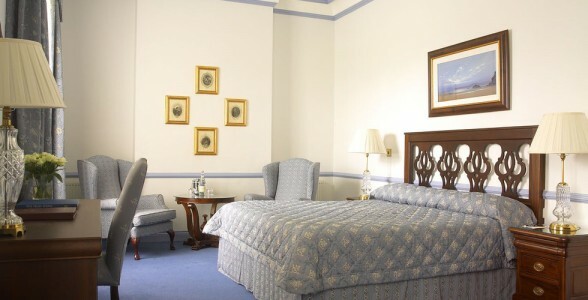 You will stay in some of the most famous and highly regarded hotels in Ireland. Luxury is standard in all these hotels and you can expect exceptional accommodation, a wide range of guest facilities and top class dining as well as impeccable and friendly service. Dromoland Castle (pictured above) in Co Clare, where American presidents have frequently been guests, and its sister hotel Ashford Castle with its huge and lovely sporting estate in Co Mayo are among the top castle hotels in the world. Waterford Castle, located on its own private Island and reachable only by boat, is a perennial favourite not just for its unrivaled privacy and seclusion, but its excellent facilities. Adare Manor (pictured below) is famous for its championship golf course, but has plenty to please even non-golfers. In Kerry Ballyseede Castle will be your home for two nights while in Galway you’ll stay Ballinhinch Castle, with its wonderful views over a Connemara lake. Your guide will be an experienced drivers with an impeccable safety record and will have an extensive knowledge of Ireland. More than that, all our guides are friendly, flexible and easy company, adept at dealing with any problems that may arise and at making sure their guests have the best possible experience at each place they visit. They are committed to making your trip an enjoyable and truly memorable one. As well as providing guided tours each day, guides are happy to make suggestions about good places to eat out or about evening entertainment options and to make reservations for you also. All our vehicles are recent Mercedes models, or others of equivalent standard, which are configured to maximise touring comfort and passenger space. Smaller parties will travel in a Mercedes E Class Sedan, others in Mercedes Sprinter or Vito vans or small buses. All vehicles have air conditioning, comfortable and roomy upholstered seats, state of the art sound systems, satellite navigation and among the highest safety standards in their class. Accommodation for 7 nights in specially selected Castle hotels. All petrol costs, road tolls and applicable taxes.